Welcome to Fantasy Roleplaying as it was meant to be. 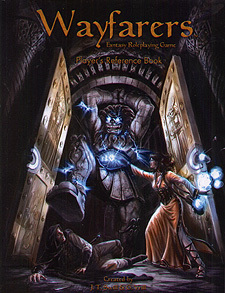 Herein you will find everything a player needs for the Wayfarers Roleplaying Game. Whether you wish to play a brawny wizard, a cutthroat knight, a foppish assassin, a corrupted priest, a bookish rogue, or a more archetypal persona, Wayfarers makes it possible. With a focused skill system, four types of magic, and over 500 spells, the possibilities for players are endless. So open these pages and grab your dice. Your destiny awaits, ....for good or ill.